The Lyrid Meteor Shower is a Class 1 Major Shower which peaks on 22 April. The parent comet is P/Thatcher 1861 G1 with a zenithal hourly rate (ZHR) of 15 meteors an hour, travelling at a velocity of 47 km/sec with about 8 percent leaving persistent trains. They emanate from a point about 10 degrees southwest of the brilliant star Vega. There are a few interesting things to point out in this particular image. Note that the *asterism Collinder 399, Brocchi's Cluster also known as "The Coathanger" in Vulpecula is at top in between the two Lyrids. This is a fantastic group to observe with binoculars. Also for those with keen eyesight, you can make out Sagitta "The Arrow" and if you zoom into it the M71 globular cluster is easily seen; Delphinus "The Dolphin" is at the bottom of the photo and the constellation Aquila is below the 'streak' to the right of the image. All this area is contained within the Summer Triangle, which is made up of Deneb in Cygnus, Altair in Aquila and Vega in Lyra. These constellations are easily visible during the summer months. *asterism is a pattern of stars which are not physically related. The Geminid Meteor Shower of 2012. 13-14 December. It originates from asteroid 3200 Phaethon as opposed to a comet. Their higher rocky meteoroid density suggests they are fragments of an asteroid and that is why they often appear to last slightly longer before extinction than those from other showers. They are a good target for photographers. Bright meteors are yellowish, fairly fast and sometimes of long duration. 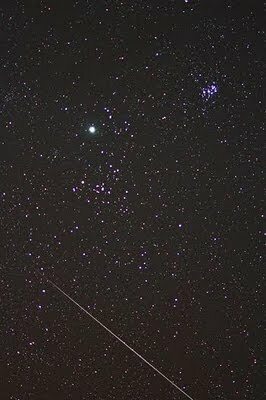 The image on the left shows 2 Geminids streaking through the constellation of Orion. Note that the Orion Nebula is evident as the "middle" star in the Sword of Orion. The image on the right shows a Geminid gliding by the constellation Taurus. The 'V' shape of the Hyades open cluster is recognisable; so too is the open cluster M45 better known as the Pleiades or Seven Sisters which is clearly visible at the top right hand corner. The planet Jupiter was also in the area at the time.